Author(s): Aurelio A. Moya García, Ian Morilla, Juan Juan A.G. Ranea. Dept. Molecular Biology and Biochemistry-CIBER de Enfermedades Raras, University of Malaga. Malaga Spain and Institute of Molecular Life Sciences and SIB Swiss Institute of Bioinformatics, University of Zurich, CH-8057 Zurich, Switzerland. The large collection of mutated genes in the cancer genome mapping onto a reduced set of signalling pathways highlights the paramount importance of signalling pathways in cancer therapeutics. Signalling proteins operate through a large and complex network associated with cell properties and ultimately reprogrammed in order to implement the known hallmark capabilities in cancer cells. Overall the underlying connection between signalling networks and the hallmarks of cancer may be considered as an organising principle that fixes the framework for understanding the remarkable diversity of this disease. There is a growing body of evidence suggesting that drug polypharmacology is the rule rather than the exception to overtake the limited success obtained in clinical treatment of cancer. Further the need for multi-target approaches, the combination between network pharmacology and polypharmacology is shifting the specific targeted drugs paradigm. In this novel systemic paradigm the dysregulated signalling networks themselves emerge as a class of targetable entities. Diverse cancer types and even a heterogeneous cellular population within a cancer type may exhibit heterogeneity in their signalling networks. We review these emerging trends in the field of computational and systems biology to achieve a more effective and safer control of cancer. Keywords: Cell signalling, oncogene, polypharmacology, signalling network, signalling pathway, tumour heterogeneity. Affiliation:Dept. Molecular Biology and Biochemistry-CIBER de Enfermedades Raras, University of Malaga. Malaga Spain and Institute of Molecular Life Sciences and SIB Swiss Institute of Bioinformatics, University of Zurich, CH-8057 Zurich, Switzerland. Keywords:Cell signalling, oncogene, polypharmacology, signalling network, signalling pathway, tumour heterogeneity. Abstract:The large collection of mutated genes in the cancer genome mapping onto a reduced set of signalling pathways highlights the paramount importance of signalling pathways in cancer therapeutics. Signalling proteins operate through a large and complex network associated with cell properties and ultimately reprogrammed in order to implement the known hallmark capabilities in cancer cells. 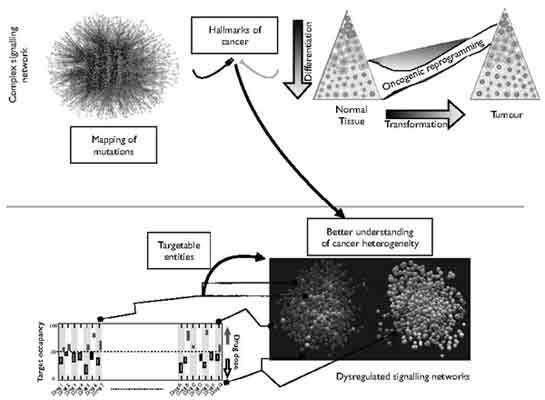 Overall the underlying connection between signalling networks and the hallmarks of cancer may be considered as an organising principle that fixes the framework for understanding the remarkable diversity of this disease.